LOS ANGELES (AP) — Right fielder Yasiel Puig will be hitting fifth in the Los Angeles Dodgers‘ lineup for Game 2 of the National League Division Series against the Atlanta Braves. Manager Dave Roberts moved catcher Yasmani Grandal to eighth after he went 0 for 4 with three strikeouts hitting in the fifth spot in Game 1. The Dodgers kept their lineup intact in facing their second straight right-hander. Anibal Sanchez started for the Braves on Friday after righty Mike Foltynewicz made his postseason debut in Game 1. Left fielder Joc Pederson leads off for Los Angeles, followed by third baseman Justin Turner, first baseman Max Muncy — who hit a three-run homer in Game 1 — and shortstop Manny Machado. After Puig, center fielder Cody Bellinger, second baseman Enrique Hernandez, Grandal and pitcher Clayton Kershaw round out the order. Atlanta manager Brian Snitker made just one lineup change, inserting Kurt Suzuki at catcher in place of Tyler Flowers, who struck out in his first three at-bats before singling in the ninth. Suzuki will hit in the same fifth spot that Flowers did. 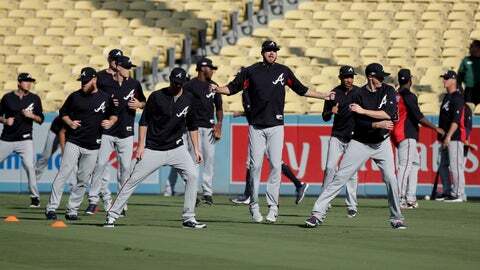 The Braves outhit the Dodgers 6-5 in Game 1, but Atlanta only had singles. Besides Muncy, the Dodgers got homers from Pederson and Hernandez. Left fielder Ronald Acuna Jr., third baseman Johan Camargo and first baseman Freddie Freeman were the top three for the Braves. Right fielder Nick Markakis was hitting cleanup, followed by Suzuki, second baseman Ozzie Albies, center fielder Ender Inciarte, shortstop Charlie Culberson and Sanchez.